Your Ski Log is back with a vengeance. 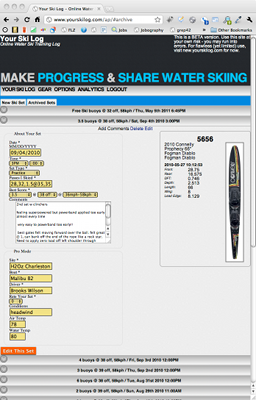 With a renewed interface, faster page loads, sleek transitions from page to page, use Your Ski Log to save information about every set you ski this summer. The majority of the work that's been done over the past few months with the ski log involved completely refactoring the old log. I'll spare you the details on the technicals, but if the old ski log was a rat's nest of wires, the new one is a switchboard. While the log is essentially unchanged in its function, the dramatic increase in organization opens up doors into the future. Later this summer you'll see the return of the Ski Log Rankings list, and eventually the return of an online water ski league. When the ski log was originally developed it had none of these things in mind - they evolved through suggestions from people just like you. 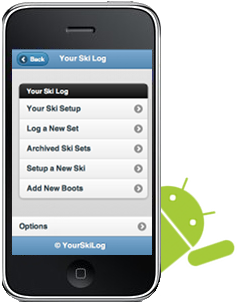 In addition to a great new desktop version of Your Ski Log, a new Mobile Application goes right along side. Simply hit www.yourskilog.com and log in from your mobile device to see the new ap. It's compatible with Apple's iPhone, all Android Devices, Blackberry 6, and Windows Phone 7. There's no sense in developing native applications for all these phones -- Your Ski Log works on all of these platforms simply by hitting the web address in your phone's browser. Save the address to your phone's home screen for easy access. In 2004, Google bought a company called Keyhole, which had access to a variety of satellite imagery. One thing lead to another and by 2005 there was Google Earth: a program that let you spin the virtual globe, zoom in, tilt, and even fly flight simulations over a digital earth colored with satellite imagery. Around the same time, Tony Lightfoot had a great idea: start tagging ski lakes in Google Earth and publish the file. And so the many incarnations of the Google Earth KMZ Ski Lakes file were born. Over the years, Tony's found something better to do with his time at waterskibroadcasting.com - and Shelby Coke has taken over the map file maintenance role. Thanks to both of you for bringing the project this far! Recently, the folks over at the ball of spray started asking questions about how to keep this file up to date. There are inherent challenges to updating a single static file that lives on one person's hard drive. Every time it's downloaded, you fork your own version. Save a lake to your personal version, download a new copy when it's updated, and you may have lost some lakes in the process. So I started thinking: "you know, there is an easier way to do this, folks". And that's brought us to the Water Ski Lakes Map Online. You'll need to use your wetJacket account to access the map - now you can save ski lakes directly through your web browser. You've got to use a log in so we don't jeopardize the integrity of the ski lakes database -- but if you don't have an account (and you're too lazy to get one) then you can just download Scoke's Google Earth file from the page. This feature in its basic form will remain absolutely free to use. It loads a lot faster and moves a lot smoother than the full fledged Google Earth application, too. Accessing the Online Water Ski Lakes Map still has some problems if you're using Internet Exploder 8 or lower, but it's been tested successfully in Chrome, Safari and Firefox. I love creating tools that can help us all as skiers -- and that's what this is. I'm hoping it will help us all make new friends, and maybe get a few more ski sets in this summer. After an October where there were very few meaningful forum posts, I made a unilateral decision to migrate our community to wetJacket. It seems I may have lost some people in the process, so an explanation is in order. The software that ran proskicoach.com for the last few years was created primarily by myself. It grew out of the forum, and, as software tends to do, it became bloated. The Online Water Ski League was and is a great idea. But running it through the infrastructure of the Pro Ski Coach Forum proved to be an impossible feat. Your Ski Log has proved to be the most resilient tool I built for PSC. But when it came time to build in the ski league with the rankings board and skier profile pages, well, just think 3 dimensional spider web. It was just too hard for one programmer to do the work within the confines of the old system. It's my fault. The back end at wetJacket is significantly more robust than PSC ever was. For me, it's an incredible load lifted from my shoulders. The site just works. I migrated 2800 user accounts and about 12,000 forum posts over to wetJacket and locked out the PSC forum. Moves like this are hard to pull off with success, but, it's the only way our network can grow. The user profiles, messaging system, and forum at wetjacket is everything that I hoped PSC could be, plus it manages Events, Groups, a Marketplace for gear trading, and gives every skier using the site a personal blog to share with others. With a fresh start, I'm free of working with the more tedious aspects of the old Pro Ski Coach. So today, Friday January 7, I'm proud to release The new Pro Ski Coach. It will take a day or two for changes to propogate, but by next week, you'll see what I mean. The new Pro Ski Coach is, for me, a joy to work with. I can develop new features so much more quickly and easily than I could before. It all comes down to execution, and now I have a lot more tools at my disposal. After that, it's back to waterskileague.com, which, I know needs a lot of work after last year's slow, silent death. Most of the participants in the ski league stopped posting scores - which certainly didn't help my motivation level. There are a lot of improvements that need to be made. It was hard to predict what would happen in the league during its first year. Now that 2010 is behind us, I have a year's worth of ski league data that I can work with. Organizing the scoring system for last year's ski league was difficult without data to work with up front. I didn't know how it was going to pan out, and that's my fault. I released the league too soon. But now that I'm free of all the worst parts of ProSkiCoach.com, and I have a fresh start with a new system running, I know that I can deliver in 2011. I need your feedback. What do you want to see in 2011 that would make you more satisfied? Thanks for your support. Call me at 781-346-9754, anytime. If you had a Pro Ski Coach Account prior to November 11, 2010, then use your E-Mail Address to Reset your Password at wetJacket. You'll get an email back from wetJacket that asks you to click on a link to confirm your password reset. After clicking that link, you'll get a second email containing your temporary password. If you have an active wetJacket account, use your Username or E-Mail Address and wetJacket password to log in at Pro Ski Coach. If you signed up at Pro Ski Coach between November 11, 2010 and January 5, 2010, you'll need to Register at wetJacket to use the Pro Ski Coach site. Here in the US, while we were all getting over our Turkey Hangovers last week, it seems some confusion has been mounting on the direction of Pro Ski Coach, and what this new thing called "wet jacket" is all about. So I'd like to dispel some confusion. Pro Ski Coach was created to bridge a gap between Pro Skiers and the skiers out there who are not involved in water skiing at any significant level. For me, when I was growing up water skiing I was isolated - I was on a public lake with my family, none of which who were water skiers. This is the situation that Pro Ski Coach was really there to fill - if you didn't have a local guru to show you the path, maybe Pro Ski Coach could help. As things have evolved over the years, multiple forums have cropped up all over the place. Knowledge is more and more available everywhere on the web. Although Pro Ski Coach has well over a million views just this year, I've sensed that it's time for a change. Some people are simply adverse to being coached, and in order to grow a change is needed. Over the coming weeks you'll start to see some major changes here @ PSC. We'll be revamping, simplifying, and getting back to the true meaning of this site -- which is to offer professional lessons from the best skiers and coaches in the business. The Pro Ski Coach Forum has a wealth of knowledge available -- and it will stay available. However, no new posts are being made on that forum and I'd suggest you move your conversations to the wetJacket Forum. Your Ski Log is a great little ap that lets you log your sets and track your progress over time. We'll be continuing development on Your Ski Log this winter, along with the Summer Shootout league. You don't need a wetJacket account to use Your Ski Log or to use our Online Coaching. This may change in the future, but for now, wetJacket is available as a place for skiers to connect, share, and learn on your own terms. 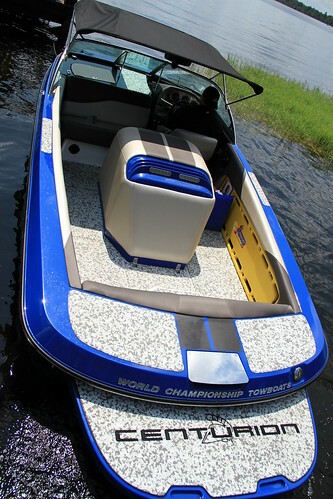 It's nice to see a major boat company bringing real innovation to the waterski market. MasterCraft, Malibu, and Correct Craft have led the pack for years. Ski Centurion out of California has spent the last few years dominating the Wake Surfing market. They actually hosted the first annual Wake Surf World Championships on the Mississippi river in downtown Minneapolis this past summer. This fall they debuted their new Carbon Pro, and I've got to say it's one thing that has me excited about water skiing for next year. 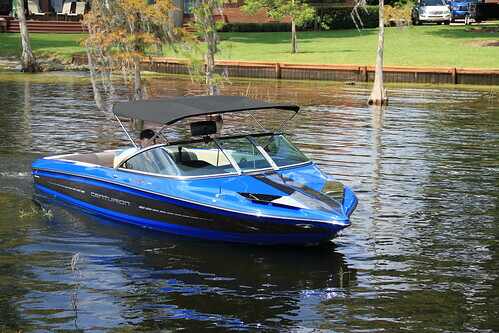 The brand New Centurion Ski Boat brings some of the most innovative featues to a ski boat since speed control. 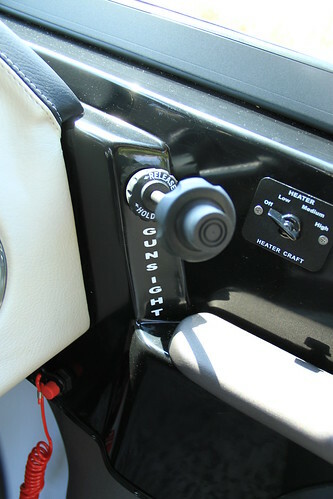 The cockpit features an adjustable Gunsight. 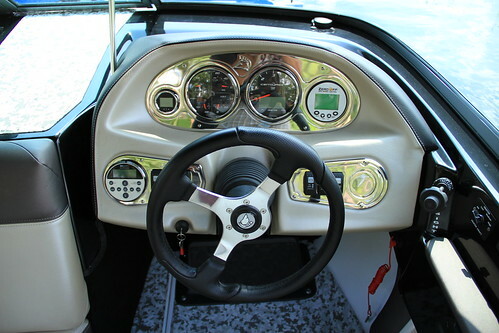 The driver can adjust the sight to the left or right, giving each unique driver a way to sight straight down the starboard side gate line. While the best drivers in the world can handle keeping the boat straight on their own, your ski partner may not be. The gunsight makes it easy to keep the boat lined up. The Centurion Carbon Pro has been approved by USA Water Ski to pull three event tournaments, and comes with the solid PCM Engine. Look forward to skiing behind this one at tournaments in 2011. In any sport, injuries happen. In waterskiing, many of our ankle injuries directly relate to our gear choice and our skill level. If your ninja cat balance isn't with you on the water yet, it may be a little early to make a move to hardshell bindings. You can get hurt in any boot, but the added rigitiy of the high end boots on the market will tend to punish the less experienced and more unbalanced water skiers. BLUE: A faster, more efficient line. That red line that MyPH is skiing, is how a solid 50% or more of waterski ankle injuries occur. 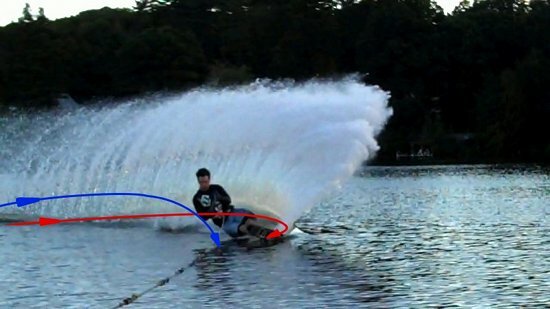 It's hard to work through this strategic error in technique, because the line that MyPH is skiing is a natural line for skiers to ride when they get into the slalom course. Some pros can even make that line work. The downside is, as you may imagine from the red line, you're trying to turn your ski much, much more than what is obtainable. You can't hold the angle out of the turn like that... you'll edge change before the second wake and go straight at the next buoy, and repeat. Completing an extremely sharp turn after the buoy in hardshells is easy, and dangerous. In rubber boots, it's harder to whip your ski around like this at the finish, but if you did, rubber boots have more forgiving stiffness and releasability. Let's just imagine that a skier who was on the red line crashed right at the end of the arrow. The tip got too deep, the ski went underwater and being a bada$$ skier, you're going to hold on. You keep your feet in the water and hands on the handle, the ski litterally will skip up and back into the water OR you will just get pulled over the side of your ski. You have a pretty decent shot of coming out of rubber boots in this crash (but not with ho approaches or connelly enzos.) In hardshells, if you're running a front reflex and a rear toe loop, you'll probably release in this crash. 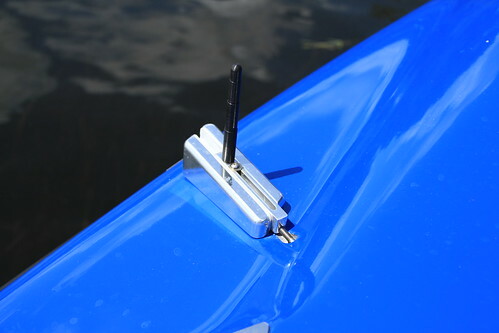 In any other hardshell system, it is virtually impossible for the release mechanism to decipher between a radical 120 degree turn over a distance of 10 feet, versus cutting behind the boat. Once your ski is between you and the boat, you're not going to release. The forces are simply directed down your legs and directly into the top of the ski -- if the forces are pointed down into the top of your ski, your chances for release are slim. This is where the majority of your achilies injuries occur. The vast majority of waterskiers (75-85%) out there ski on the red line. Anything short of a great gate will automatically put you on this line... and cranking harder and harder turns through the finish seems like the only answer. When I made the switch to hardshell bindings, I remember taking plenty of crashes, trying to hold on to more than what's possible, right through the finish of the turn. (i didn't wear a neck brace, clinchers, and body armor). These turns feel cool, but are unsustainable from a physical durability standpoint. If you do find yourself about to take this sort of fall, the best thing to do is roll onto your back. Mario is doing a great job in the fall above. He could have stayed on the red line, taken an unobtainable turn, and potentially take an ankle injury. Mario has decades of waterski experience and he's learned to complete this tuck-and-roll manuver to save his body. Sure, the crash looks extreme, but you're landing in water, and if you can do so on your back, the likelyhood of injury is dramatically reduced. As we move into 2011, you'll see some new boot/binding systems become available. At this time, however, the Reflex front / rear toe plate back is the "safest" or most consistent release in this type of fall... but don't let that influence your purchasing decisions 100%. Remember, you can get hurt in anything, and it's your responsibility as the skier to protect yourself in the event of a fall. The best advice is to ski in control and in balance, no matter where those orange buoys are. Update: MyPH sent me a message after I originally posted his picture in the forums under Moved to Hardshells. Unfortunately my warning about the red line came a little bit too late: two passes after that picture was taken, MyPH experienced the same fall and ankle injury that I'm talking about here. Well, it's October. The leaves are turning and I'm excited to feel the cool air this Fall. I've been hard at work laying the ground work for the future... and it won't be here at Pro Ski Coach dot com. Since PSC went live in 2008 we've experienced so much growth that it's hard to keep up with. The groundwork of the site was built around the forum, and while that was all fine and dandy for a while, I've been adding new things so quickly for so long that it has become somewhat unmaintainable. But it's good to grow out of situations and apply all those lessons learned. I just finished up logging my sets from the Malibu Open in Milwaukee. I didn't do a good job of ski logging leading up to the event, and although I have skied and logged sets since the debacle, I waited until now to enter my sets from the Malibu Open at Juneau Park Pond. Now's a good time for some re-encouragement to continue logging your sets at this time of year. It's easy to get distracted with the events of a summer, and even easier to get off track. The simple act of recording your thoughts -- via YourSkiLog or on paper, allows you to briefly re-live your set. It takes just moments to recall each of the passes you skied. By taking those simple moments to keep a true record of your skiing, all aspects of your sport will benefit. Your technique, your training habits, your internal motivation must all improve, and to maintain that sort of comitment, if you are not keeping a record you are cheating yourself. You can use paper, but it's disposable, flamable, can get lost or stolen... Or you can trust YourSkiLog.com - worst case scenario you may loose a week's worth of sets. But certainly no more, and much more likely, we will maintain our trackrecord of securely hosting each Ski Log. By writing thoughts down about your passes you'll give your brain a chance to catch up with what you may have learned during your sets. Do it. The Athletes and a Little Girl who couldn’t stand in line! My name is Kris Vanden Boom and am an avid water-skier, Husband to my wife Donna, and Father of four beautiful girls. I am writing this first and foremost as a thank you to all those at the Malibu Open that made this a very special event for my family and me. We arrived on Friday afternoon and saw the end of the qualifying round of Slalom and Jump. The kids had a blast and wanted to come back for Saturday’s finals. What was normal was the access we had to the pros that were there. This was completely expected but nonetheless, it was exciting to be so close. What was unexpected was the amazing attention we received as a result of the physical limitations of my daughter McKenzie! On Saturday, we arrived early to get good seats. We were surrounded by chairs behind and on the sides making it difficult for us to come and go. After the semifinals were done and autograph signing was set up and two of my girls were in line. McKenzie, my other daughter was not able to get in line. You see, she was in her wheel chair and it was tough to get the chair through all the people and even more challenging for her to stand in long lines. That is when I walked up to Debbie Reed (one of the staff members for the pro ski tour) and asked if it would be possible to get a few athletes to come over to where we were sitting and sign McKenzie’s chair. First, a few skiers that were close by came and signed Kenzie’s chair and spent some time talking to her about adaptive skiing. Among them were Terry Winter, Seth Stisher, Thomas Moore, Billy Susi, Cale Burdick, Jill Knutson (who offers Adaptive Waterskiing back at her school in Lake Stevens, Washington), and others. My mother in law was with us and she was even teary-eyed watching the whole thing. The level of engagement between these athletes and a little girl who couldn’t stand in line was wonderful and had Kenzie grinning from ear to ear. At this time Finals were also getting underway so people flocked to there seats and we were once again surrounded. I was extremely grateful to Debbie and thought that would be it. I had no idea that Debbie was diligently working to get more athletes over to us. One by one they weaved through the people to reach my daughter and give her and us some quality attention. Those around us were somewhat in awe and wonderment as to what was going on. Imagine the looks in there eyes when Marcus Brown made his way to Kenzie, got down, signed the chair, and began talking to us. Grandma had a few more tears. Later it was Chris Rossi signing our Nintendo DS and still later Brooks Wilson tracked us down at the bathrooms (are you kidding me). Seth Stisher set the kids up with H20 Shirts and Jodi Fisher provided Kenzie with a shirt that she has worn 7 out of the last 10 days. These athletes are far more than just accessible at these events. To say that is a complete understatement. Yes they want to promote the sport, product lines, boats, etc… In the end they are far more giving than any other group of athletes I can think of. Try getting this kind of response in the middle of a pro football game or baseball game. I was genuinely impressed by the interest that all of the coaches had around adaptive waterskiing. Seth Stisher, April Coble-Eller, and obviously Jill Knutson were just a few who really seemed interested. I would like to encourage all of the schools in the country to consider offering programs and providing equipment with the support of local therapeutic suppliers. Finally, there were others signing the DS player and the chair but the final highlight came in the dark with a packed crowd when April Coble-Eller made her way over. She apologized for taking so long. The Malibu Open Women’s Champ, winning her first Major Pro Tournament, celebrating and enjoying the moment, apologized for taking so long!!! She gave almost all of her bracelets to my kids, spent time with McKenzie, shared pictures of her family, and just relaxed with us for a little while! So, all in all, I would say we are ready for the Malibu Open to come back to Milwaukee next year. Until then, a heart felt thank you to all the athletes, to those who ran the event, Tinus Marine, and especially to Debbie Reed.